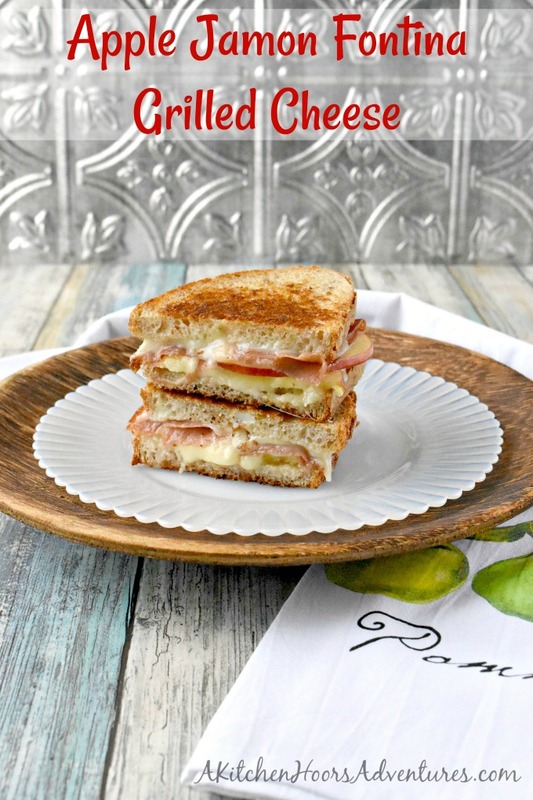 Apple Jamon Fontina Grilled Cheese are a sweet and savory sandwich everyone will devour! 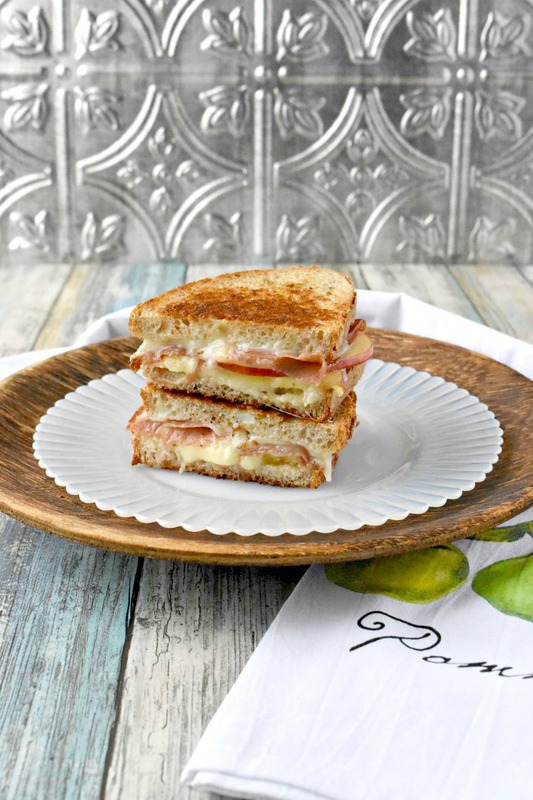 The sweet apples, the salty jamon, and the creamy Fontina all come together in this decadently delicious grilled cheese sandwich. They’re easily grilled up on the Swiss Diamond, two burner griddle. This post is sponsored in conjunction with AppleWeek . I received product samples from sponsor companies to aid in the creation of the AppleWeek recipes. All opinions are mine alone. I feel like this week has been going by so slow. Which is a good thing because I don’t want #AppleWeek to fly by like it usually does. Of course, it helps that we added two more days than usual. Did you notice that? It started on Sunday and not Monday? Of course, if you were on top of it you’d see that my post on Sunday went live with hardly anything in it at all. I had the bones, as Carlee said, but it didn’t have any meat, veg, or even any apples to speak of. I had it in my head, and on my blog, that we were going until the 30th. Which doesn’t really explain the post that went live on the 23rd except that I’m just a blonde who has over scheduled herself for a ton of blog stuff during the most horrific time of year. But we won’t get into that. At least not until the year is over then I might unleash a total vent post that you can ignore with the exception of the delicious recipe that will be attached to it. So, keep your eyes out for that. Something to look forward to. YAY! I think every year I’ve made a grilled cheese. I have no idea why I have an obsession with making one, but I do. They’re delicious and so easy to prepare. Last year it was the apple almond butter Manchego grilled cheese. The year before that it was simply an apple cheddar grilled cheese. However, I did add some caramelized on onions to it making it more than just a plain old grilled cheese with apples. This year, I had to make a grilled cheese again. Because, my dear readers, I finally got a griddle! It’s a lovely two burner griddle from Swiss Diamond Cookware! I have been wanting to get one for the longest time, but we’re not huge pancake eaters. So, I couldn’t justify the un-needed expense of purchasing one. However, now that we have one, I have no idea how I’ve lived without one this long. To be able to make two grilled cheese sandwiches at the same time was so awesome. And I could totally make them just like they do in the diner, too! Putting the four slices of bread on the griddle and cooking them then mashing them together. OH! Smashburgers! I can make smashburgers and toast the buns at the same time! Now, I will confess it will take a little getting used to using this pan. It goes over two burners and, well, I don’t have two that are the same size. I put it over the two that were pretty close and turned the larger one down what I thought was enough, but one sandwich did get a little more done than the other. Just warning ya when you go to purchase one it will take some getting used to. With the learning curve aside, this griddle pan is AH-mazing! It comes clean super easy. Swiss Diamond, for those that don’t know have invented a way to combine read diamonds with high quality non-stick composite for top quality non-stick performance and durability. This combined with their induction cookware makes for a pan that heats up quickly, evenly, and cleans easily. All wins in my book! See how evenly toasted the bread toasted? You can see that the heat distribution is consistent and even. If I had cooked that up in my regular non-stick skillet, it would be more brown in the center and lighter around the edges. Of course, we won’t talk about the fact that I misjudged the one in the back that you can’t see that is slightly extra brown/black. We won’t mention that one at all. Of course that didn’t affect the creamy sweet goodness that was going on in this sandwich. The apples still have a little crunch to them and don’t turn to complete mush. But that’s because of the apples I used. You can see yesterday’s post to read all about them. They’re AWESOME! I love how you can see all the layers in the grilled cheese. From the cheese, to the apple, to the cheese, to the jamon, to more apple, and finally more cheese – yes, that’s three layers of cheese! You counted correctly. 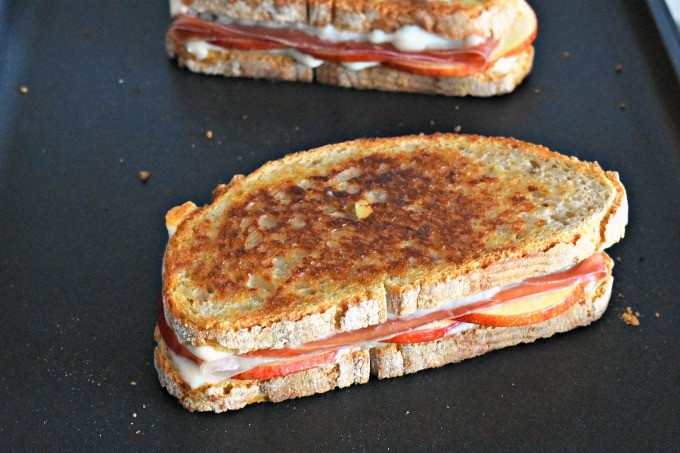 Because isn’t a grilled cheese all about the cheese? At least it is in our house! I couldn’t get the griddle itself to stand up back there so I thought the packaging was sufficient. You can see that it’s a good sized griddle. It would easily hold 8 burgers or 6 grilled cheese sandwiches depending on the size of your bread. I used a rustic farmer’s bread from Lidle which is a pretty good size and tastes hearty. It was definitely strong enough to hold up to all those layers of cheese. You see what I mean about all those layers? Confession time. I thought I had prosciutto in the fridge. I thought I’d purchased a package for these sandwiches. Since I frequently peruse the cheese and meat section of the grocery for anything interesting and noteworthy, I thought the salty jamon would be a better fit for the cheese I selected and the sweet apples. So, I tossed a package in the cart. I pull all the ingredients out of the fridge to make these for lunch Sunday and low and behold I have two packages of jamon and no prosciutto. I swear, if my short term memory was as good as my food memory I’d be golden! Sometimes I have to struggle to remember what I had to eat the day before. And don’t ask me how old I am. I have to do the math in my head to answer that one. 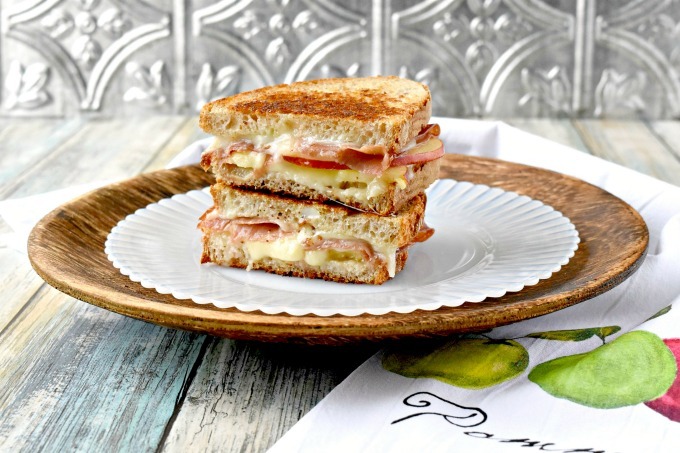 Along with macarons, I do have a bit of an obsession with grilled cheese sandwiches, too. The latest being that butter poached lobster version that we died over. OMGoodness it was SO GOOD! Smack your grandma good. Want to eat this every for the rest of my life good! Even the hubs said we could have that again if I wanted to. That’s saying something. Of course, with my new griddle, I could easily whip those up in no time. Maybe next weekend to celebrate hell month being over. I think that’s a good idea! Don’t forget to enter the giveaway! Give yourself a head start and follow Swiss Diamond on Facebook and Twitter. I would like this sandwich with a big mug of tomato soup. YES! We do that often here. 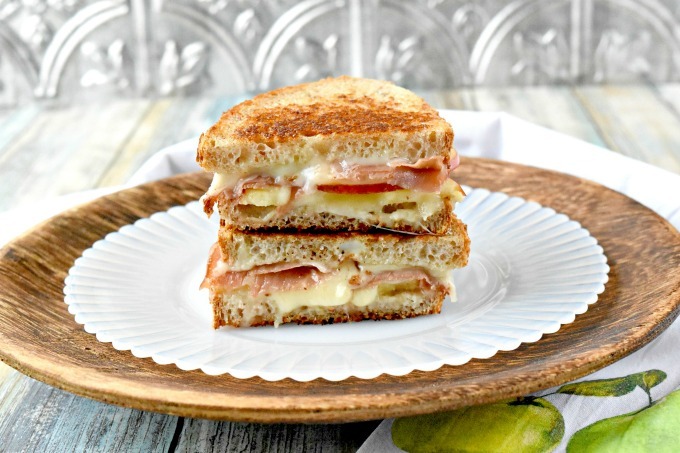 This would be perfect for lunch today!